CHEF KATE ADAMICK, Principal of Food Systems Solutions® LLC, is a New York City-based consultant specializing in integrating operational changes, site-based programming, and public-private partnerships to implement, reinforce and support the healthful transformation of institutional meals programs and aid in developing local and sustainable agriculture systems. She has worked for school districts, hospitals and retirement communities across the United States. As co-creator of the Cook for America® Lunch Teacher® Culinary Boot Camps, featured on PBS NewsHour and ABC Nightline, she provides concentrated and comprehensive culinary training that transforms America’s school food service personnel into skilled and passionate professional culinarians. Adamick is a frequent speaker on institutional food systems, sustainable agriculture, childhood obesity issues and the economics of school food reform, and has appeared on stage with such notables as Dr. David Kessler, Dr. Nancy Snyderman, Dr. Marion Nestle, Dr. Adam Drewnowski, Dr. David Ludwig, and Morgan Spurlock. Adamick is a regular guest lecturer at New York University, has presented at The Aspen Institute’s Health Forum and Montefiore Medical Center’s Social Medicine Grand Rounds, and has co-taught a course called “Blueprint for a Green School” at Antioch University NE. She has also been an invited participant at Alice Waters’ “School Lunch Initiative Roundtable” at the Smithsonian Folklife Festival in Washington D.C. and the TEDxManhattan conference “Changing the Way We Eat”, and has been a featured speaker at conferences held by Rockefeller Brothers Foundation, Yale University, the Community Food Security Coalition, the International Association of Culinary Professionals, Women Chefs and Restaurateurs, FoodService Directors Magazine, Field to Plate, Interact for Health, Kansas Health Foundation, Colorado Association of School Executives, The Orfalea Foundations, New Jersey Farm to School Network, Washington Sustainable Food & Farming Network, Philadelphia’s Food Trust, Chicago’s Healthy Schools Campaign, Grimm Family Education Foundation, Better School Food, Stone Barns Farm, and the PRI Institute. Adamick is a featured blogger for The Atlantic and has appeared in numerous articles in the New York Times, The New Yorker, The Los Angeles Times, The San Francisco Chronicle, The Denver Post, The Daily News and USA Today, about school lunch programs, industrial organics and farm-to-school initiatives. She is also featured in Free for All: Fixing School Food in America by Janet Poppendieck (California Studies in Food & Culture, 2010) and Lunch Lessons: Changing the Way We Feed Our Children, by Ann Cooper and Lisa Holmes (HarperCollins, 2006), has been a guest on PBS’s To The Contrary, and appears in the documentary film Two Angry Moms. Her frequent essays relating to food systems can be found on various blogs, including Jamie Oliver’s Food Revolution, GenConnect, and Nourish. Adamick has served as consultant to Interact for Health Foundation’s Healthy Eating & Active Living program, the Colorado Health Foundation’s Healthy School Meals Project, for the Children’s Health Foundation’s Lunch for Life project, and to the Empire Health Foundation’s strategic grants division. She also created the Orfalea Foundations’ School Food Initiative in Santa Barbara County, California, and acted as the Project Director during the inaugural year of the SchoolFood Plus Initiative in New York City. Adamick’s eclectic experience includes her careers as a corporate attorney, a professional chef in both white tablecloth restaurants and senior living communities, a small business owner, and a professional photographer. Adamick is the author of the highly praised book, Lunch Money: Serving Healthy School Food in a Sick Economy, and publishes a food photography blog called EyeSlobber. CHEF ANDREA MARTIN, Principal of Chef Andrea Martin LLC, is a Brooklyn-based consultant who specializes in school lunch reform projects and integrating culinary educational initiatives into the school community. Her expertise includes training and professionalizing school food service personnel, menu and recipe development, and educating elementary and secondary students through effective social marketing tools and programming. As co-creator of the Cook for America® Lunch Teachers® Culinary Boot Camps, featured on PBS NewsHour and ABC Nightline, she provides concentrated and comprehensive culinary training that transforms America’s school food service personnel into skilled and passionate professional culinarians. Through her signature Jr. Chef events, Martin raises the food IQ of elementary students by introducing them to the fundamentals of cooking, the concept of sustainability, and the joys of eating whole, fresh foods. Martin speaks on school lunch reform issues to parents, school communities, and educators across the country. She was a featured speaker at the 2009 Women Chefs and Restaurateurs Speakers Series at the Culinary Institute of America, and was the keynote speaker at the Maine Nutrition Network 2010 Annual Conference. Martin also appears in the documentary film Two Angry Moms. Martin’s educational background includes a Bachelor’s Degree from Amherst College, a Master’s of Science in Teaching from the New School, and an Associate’s Degree in Culinary Arts from the Culinary Institute of America. During her tenure as a New York City schoolteacher, she designed and implemented a culinary arts training program for high school students and formed a successful social purpose catering company employing graduates from the culinary program. The business, Venture Catering, was a runner up in the Yale-Goldman Sachs Social Purpose Business Plan Competition. Martin’s clients include the Colorado Health Foundation’s Healthy School Meals Project, the Orfalea Foundations’ School Food Initiative, the Children’s Health Foundation’s Lunch for Life project, and the Berkeley Unified School District in California. Martin is an active member of Women Chefs and Restaurateurs, and was chosen as the Catherine Brandel Scholar in 2006. CHEF SALLY AYOTTE, Mobile Chef Supervisor, began her work with Cook for America® in 2010 as a chef educator, bringing with her a 28-year history of preparing and serving healthy and delicious food. She earned her Bachelor’s of Science in Food and Nutrition from Framingham State College in Massachusetts, and later attended Johnson & Wales University in Denver, Colorado, to study culinary arts. She gained her experience in quantity food production working in various employee dining venues and health care facilities in remote corners of the world. 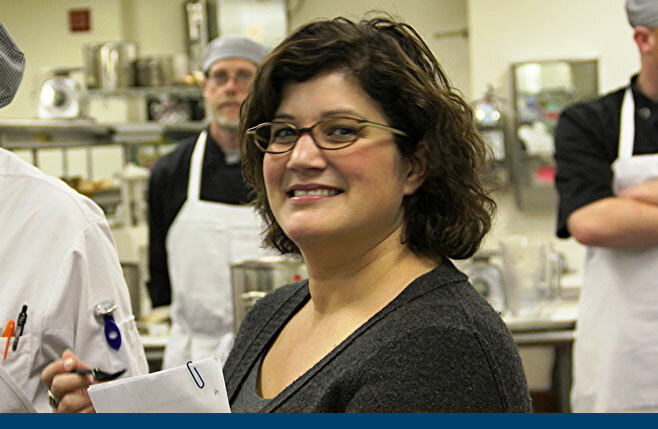 From seasonal kitchens in Denali National Park, Alaska, to 12 years with the National Science Foundation’s United States Antarctic Program, Sally has skillfully guided cooks in preparing healthy, delicious meals to meet various nutritional requirements. She currently lives in Salida, Colorado, where she owns a private practice in nutrition consulting, diabetes self management, and food service management. In Salida, she works with local organizations such as Head Start Programs, the Area Agency on Aging, and various community and public health organizations encouraging people of all ages to engage in a healthy eating and active living lifestyle. As a Mobile Chef Supervisor with Cook for America® and chef instructor at the Cook for America® Lunch Teachers® Culinary Boot Camps, Sally shares her knowledge and passion for good food, made from scratch, with school food service employees. By so doing, she helps them acquire the skills necessary to prepare delicious meals that will prepare their students for a lifetime of healthy habits. CHEF PAMELA NANCE LEE, Mobile Chef Supervisor, has been procuring and preparing local foods since the early 1980s, and began her work with Cook for America® in 2010 as a chef educator. Chef Pamela plays vital roles in the Cook for America® Lunch Teachers® Culinary Boot Camps and as a Mobile Chef Supervisor to school districts that participate in those camps. Her expertise in volume food production strategies and the National School Lunch Program protocols make her an invaluable asset in transforming convenience-food based kitchens to scratch-cooking operations. Chef Pamela studied Foods and Nutrition at Northern California’s Humboldt State University, where she formed her views and knowledge about local and organic foods. After graduating in 1987, she enlisted in the Peace Corps Guatemala, where she studied Spanish and worked with a Community Health Project. Upon returning to the United States, Chef Pamela began her 25+ years of work centered on the preparation of healthy and delicious foods. Some of her former employers include: Arcata Co-op Whole Foods Bakery; Ventura’s City Bakery; Patagonia’s Employee Natural Foods Cafe; Santa Barbara’s Our Daily Bread; County of Ventura’s Senior Nutrition Program; Santa Barbara’s Community Action Commission Nutrition Services; and, the Orfalea Foundations’ School Food Initiative. Pamela owns Organic Planet Services, a catering business that provides local organic food for large multi-day events such as yoga retreats, perma-culture design courses, and natural building colloquiums. Pamela believes that eating locally produced foods grown in a sustainable manner nourishes our bodies and our planet. CHEF FERNANDO CARDONA, Chef Instructor, is based in Denver and began working with Cook for America® in 2011. Fernando has spent his entire adult life cooking in professional kitchens. His culinary experience includes positions in staff training and management, as well as playing key roles in numerous restaurant openings. Fernando currently works with Lunch Teachers® from many different school districts throughout the country, teaching them to prepare cooked-from-scratch school meals within the time and financial constraints of their day to day work environment. Fernando’s quick wit and self-effacing sense of humor make him a favorite among his students. Fernando attended The Art Institute of Denver, where he earned an Associates Degree in Culinary Arts, and a Bachelor of Arts with double majors in hospitality administration and Spanish. 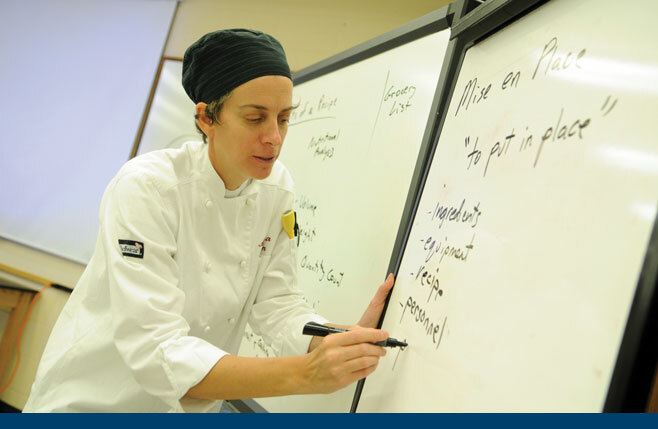 CHEF JESSICA WRIGHT, Chef Instructor, is based in Denver and began her tenure with Cook for America® in 2011. Working in the food service world since age 16, Jessica found her niche amongst the chaos and stress that can accompany this industry and thrived on it. Her desire to master every aspect of food-service, from customer interaction to plating food —and everything in between — drives her work. Jessica’s winning personality, patience, and excellent story-telling skills make her an outstanding teacher. Jessica has managed many different restaurants as a chef and as a front-of-the-house manager. She has developed in depth training programs and materials for both kitchen and the front of the house staff. She has also created standardized recipes and implemented a recipe and inventory tracking system for use across restaurant production kitchens around the world. Jessica currently works in many different school districts teaching the kitchen staff to improve their culinary skills and talking to the students about cooked-from-scratch foods. Her passion for, and dedication to, the work allows her to inspire many around her to embrace real food and to appreciate the ways in which it nourishes their bodies. Jessica attended Florida Culinary Institute, where she earned an Associates Degree in Culinary Arts, and received a Bachelors Degree in Culinary Management from The Art Institute of Denver. RISA SACKMAN, Senior Consultant for Curricula and Pedagogy, has two decades of experience providing leadership to educational and cultural organizations and has dedicated her career to creating effective educational programs, services, materials, and experiences that promote engagement and learning. A skilled manager, program/curriculum developer, teacher, and writer, Sackman is a true visionary who provides educational consulting services that help organizations build systems, processes, and resources to effectively disseminate their message, build capacity, and achieve outcomes. In her role on the Cook for America® team, Sackman is the primary developer of program materials and curriculum guides. She also serves as an instructional coach to the chef instructors, and provides ongoing formative evaluation of all programs and materials. Her role combines her experience as an educational leader, her love of good food, and her passion for the health and wellness of children everywhere. Sackman is also a senior consultant at the Academy for Educational Development (AED), where she designs, implements, and manages professional development supports and initiatives, and provides coaching and technical assistance to school leaders and teacher teams in the New York City Department of Education and Newark Public Schools. She is a co-developer of AED’s ISIS program (Indicators for Success – Interventions and Supports for Middle Grades Students), and she has developed a range of professional development services that promote effective teaching and learning practices, address young adolescent development, and create highly effective teacher teams. Sackman has also consulted and written for New York University (NYU), where she writes for the Office of Advertising and Publications; Madison Square Park Conservancy, where she developed the Mad. Sq. Kids: Explore! program that lets kids and their adult caregivers learn about the park first hand by using fun, self-guided worksheets; the NewYork Historical Society, where she developed curriculum guides to help classroom teachers incorporate primary sources into their instruction; the American Museum of Natural History, where she developed a series of teacher guides for the Moveable Museum exhibits and several temporary museum exhibits; and MOUSE, a New York City based non-profit organization that works to train middle and high school students to initiate and manage technology help desks, where she developed curriculum and educational support materials for students, faculty advisors, and MOUSE trainers. Previously, Sackman was Director of Education and Executive Vice President at TaskStream, an education firm providing web-based tools and services for K12 and higher education. While at TaskStream, Sackman was a regular presenter at national education conferences and helped school districts and pre-service teacher education programs around the country to incorporate electronic portfolios and other accountability measures into the infrastructure of their programs to better address changing accreditation requirements. Sackman began her writing career on the editorial team of The Reader’s Catalogue (then a subsidiary of the New York Review of Books), a quarterly publication that gave book lovers the ability to order books through the mail long before the internet made online book buying a reality. She began her career in education as a museum educator, a teacher, and later a school administrator in New York City. Sackman earned her Master’s in Education at Bank Street College of Education.